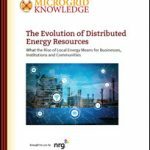 A new special report from Microgrid Knowledge and NRG Energy explores trends in local energy and distributed energy resources (DERs). This excerpt takes a look at how market factors have led to the maturity of DER technology. Distributed energy used to be simple. Put a generator in a building basement, or solar panels on a roof, and the job was done. But today’s DERs do more than produce generation. As microgrids demonstrate, they’ve become sophisticated management tools for complex combinations of energy resources and can provide a range of new price, environmental and system efficiency benefits. How did this growth in digital intelligence and management capability come about? The path to smart DER technology started a couple decades ago when demand response was a relatively new tool to curtail peak demand on an overtaxed power system. Early on, interruptible rates served as a key enabler for demand response, providing incentives for customers to reduce electricity use. In that scenario, curtailment was driven by radio controls and pagers, relatively primitive technology by today’s standards. As electronics and controls advanced, demand response systems became capable of more automated and precise two-way communications between the grid and individual devices, or loads, on the system. Technological advances in DER technology and their controls, combined with key regulatory changes, spurred further innovation and opened new markets in demand response. Organizations began to realize they also could participate in demand response programs by combining a backup generation source with battery storage and linking them together with advanced electronic controls. Rather than reduce business operations or dim lighting, they could instead curtail use of grid power with an on-site generator. From the grid operator’s perspective, the action produces the same result— the customer consumes less power when the grid is overtaxed. This approach also opened a new way to minimize utility demand charges. Such charges can be onerous for large energy users because they are set based on their electric usage during a high-cost peak period. By reducing usage at the right time, the organization could lower the charges. Operating on-site generators during this time is one way to do so. The next step was to use more than one generation resource and manage them for greatest economic flexibility. An early microgrid—although it wasn’t yet called that—tended to use a CHP plant that could operate either independently or connected to the grid. Another variation paired the CHP plant with a second form of generation, often a fossil fuel backup generator. Later, solar photovoltaics and sometimes wind turbines began to appear in the microgrid generation mix. This trend intensified with a decline in renewable energy costs, coupled with the drive by organizations to achieve sustainability goals. Distributed resources plans (DRPs) can lay the groundwork for integrating DERs into a utility’s grid, by delineating hosting capacity on the grid, providing locational values for DERs and streamlining interconnection procedures. Energy storage became the latest addition as battery prices fell. Batteries also proved to be effective energy management tools, charged when electricity prices are low and discharged when prices are high. While batteries are the most common form of storage, a microgrid may also use thermal storage, which can employ a range of mediums such as ice, earth and concrete, to capture and store heating and cooling. A market research report from Deutsche Bank predicts that in 2018, the amount of new distributed generation may exceed the amount of new central generation globally. The report estimates that the current 1 GW DER market could grow to over 40 GW by 2022, and by 2023 distributed generation could supplant the need for 320 GW of large-scale power plants. The increase in DERs will, in turn, drive the need for intelligent distribution networks comprised of nanogrids, microgrids and virtual power plants, according to the report. 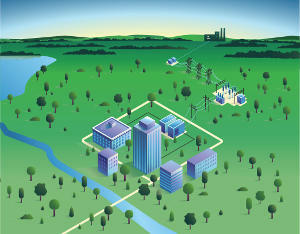 Despite their growth, DERs and microgrids face barriers to wider adoption. For example, a microgrid with only diesel generators may risk exceeding legal emissions limits if it runs too long. Financial and regulatory barriers in certain cases may also inhibit DER adoption. Expert opinion varies on the relative importance of those barriers. Sixty-one percent of utility executives identified capital and financial constraints as the top barrier to DER adoption. Only 46 percent of those executives identified regulations as a barrier. Sixty-one percent of regulators identified inadequate regulations as the top barrier. Only 33 percent of the regulators saw capital and financial constraints as a problem. This gap in perception highlights some of the challenges the microgrid industry faces in prioritizing reforms that will lead to wider adoption of DER technology. On the financial side, the lack of long-term off-take contracts raises concern. Much of the wholesale electric power in the U.S. is bought and sold on the short-term or spot market, an arena sometimes long on volatility and short on revenue that financiers seek. On the regulatory front, many states lack clear policies on DER integration with the grid. That’s starting to change. Several states, notably California and New York, have adopted policies aimed at DER integration. Similar policies have also been put in place at the federal level with more in the works. Formal state requirements for utility adoption of distributed resources plans (DRPs) also assists DER development. DRPs can lay the groundwork for integrating DERs into a utility’s grid, by delineating hosting capacity on the grid, providing locational values for DERs and streamlining interconnection procedures. In a white paper, the Lawrence Berkeley National Laboratory noted that eight states have adopted some form of DRP requirement for their investor-owned utilities. 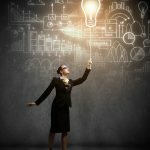 Microgrids and DERs have come of age, offering sophisticated technology and services that energy users both need and want. It is now a matter of regulation, markets and business models catching up. As we’ll see in the next three chapters, this is already happening. 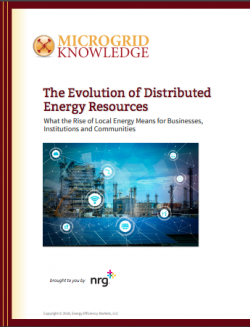 For more on the rise of local energy, see the new special report, “The Evolution of Distributed Energy Resources What the Rise of Local Energy Means for Businesses, Institutions and Communities,” courtesy of NRG, downloadable free of charge. are there any 48volt DC DERs?